Wow, this is HUGE!!! Why hasn’t this gotten a ton of coverage? Looks like US Super Sentai fans can now purchase SH FiguArts ShinkenRed and ShinkenGold figures from your local Toys’R’Us stores! These are legit, real, Bandai Japan figures, not overpriced Bandai America ripoffs, and now you can buy them someplace other than an obscure specialty shop or online. Not only that, but with a $34.99 sticker price, I believe they might also be slightly cheaper at Toys’R’Us than at the usual set of options available for US Sentai fans. detail and the highest articulation in the Power Rangers line. The figure has sleek Samurai styling making it stand out from the rest of the pack. Attach the included hand accessories and create a dynamic pose, or make the figure ready for battle with all the gear! The Shinkenger Figure is an essential item for the Power Rangers enthusiast. Collect all figures to discover the Power! Power Rangers Samurai Lost in Translation: What ever happened to Super Shinkenger Mode? This is their “Battlized Ranger” figure, which is basically an overly-decorated version of their Mega Mode Figures. While some have thought that this looked cool, a bit more samurai-ish, I think that it just looks bulky and unneccesary. These rumors come out of last week’s new episode of PRS, which was based on ep.23 of Shinkenger, the episode where Genta completed the Inromaru, the device they used to enter into Super Shinkenger Mode. However, in this most recent episode of PRS, Antonio wasn’t able to finish the Black Box, and they replaced a lot of the fight scenes with ShinkenRed in Super Mode with new scenes and a fancy group attack finisher. So this has led many to speculate that instead of using the Shinkenger Super Mode, they will replace and reshoot all of those scenes with this Battlizer, which really is nothing more than a modified version of the Mega Mode. Personally, I’m just hoping that they’re just putting off introducing the Black Box and the Super Mode, because the show will have a second season and they just don’t want to rush in and introduce it yet. They’ve already skipped almost ten episodes ahead, and the use of the Inromaru was so heavy that it would be impractical to reshoot all of that and replace it with this. I could understand using this during the megazord fight scenes, where the Black Box could upgrade the Mega Mode and morph Jayden into the Shogun Samurai Ranger, mostly because they’ve already reshot those scenes. But outright replacing the Super Mode would just be stupid and unneccesary. I don’t know what will end up happeneing, but I do know that thet will have more than one season to do it, so who knows where they’ll go with it. Heck, some people think that they will take the Goseiger footage and pull a Zyu2, if not a Zeo, and just use some of what was there to make this stuff, and that controversy started months ago when they first unveiled these toys. I don’t know, we’ll just have to wait and see. Author M.F. CalhounPosted on June 8, 2011 June 8, 2011 Categories MC's postsTags Bandai, Nickelodeon, Power Rangers Samurai, Saban, Samurai Sentai Shinkenger, Toei2 Comments on Power Rangers Samurai Lost in Translation: What ever happened to Super Shinkenger Mode? Well, now that the Gold Samurai Ranger has debutted, everyone is all abuzz about the the debut of the Female Red Samurai Ranger. Which, for those of us who watched Shinkenger, it’s not that big a shock. The big news here is that people think they’ve figured out who has been cast as the female Red Ranger, but just remember that this is rumor and speculation, so I wouldn’t freak out yet if I was you, at least not until anything can be confirmed. This is New Zealand-born actress Kimberly Crossman, the person currently rumored to be playing the role of the Female Red Ranger, whose name is suppose to be something like Meghan or Lauren. I’m not sure about the name, but I do remeber form the Breakdown (casting call) that her character was going to be refered to as the Princess. Excellent work with that translation, #TV-Nihon. Anyway, the reason everyone suspects that she’s going to play the role is because she’s been tweeting about Samurai fighting, and skills and training, as part of an acting role she’s been picked for. But that’s not the only reason. Before their roles on the show were confirmed, both Paul Shrier and Rick Medina hinted on their Facebook pages about being part of PRS, and it is possible that she could be doing the same with Twitter (By the way, you can follow me on Twitter, just look for @henshinhead). And Hector David Jr. (Mike/Green Samurai Ranger) tweeted that filming for the series is still on-going, while the suit-actor Namiehi Koshinge posted on his blog that they already finished filming for the last episode of Power Rangers. With this news, and conflicting reports about filming, people have speculated two things: 1) That Kimberly Crossman will be playing the role of the Female Red Samurai Ranger, and that she might appear much sooner than expected, and 2) That Power Rangers Samurai might try to pull a Zeo or a Zyu2 and just take the current cast and carry them over into the Goseiger adaption. I’m not sure about all of that, but I think that it’s finally sinking into Nickelodeon just how successful this show could be again. We all know it, but the tv execs at Nick are a little slow, so we’ll just give them time to figure it out. Especially if they figure out to put the merchandise into more than one freakin’ store! Go-Kaiger 199 Movie and Upcoming episodes: Pics and Rumors Galore! Hey, it’s almost the end of the month, so it’s last chance to get in this month’s new scans, announcements, and rumors before May and the next round of stuff starts pelting people in the head. So let’s get in what we still can! The official movie poster for the Go-Kaiger Goseiger Super Sentai 199 Heroes movie (coming June 11th) and as you can see, there’s going to be just a boat-load of stuff in the movie. As the title says, there are going to be 199 past heroes in the movie, and it looks like everybody and their mama has been brought back to be in this movie. Between a mix of past actors returning and reprising their roles, a bunch of evil clones, and some of the biggest baddies to ever go up against a Sentai back from hell, this promises to be one big mindblowing, sensory-overloading blockbuster smash hit! And as more news comes out for this, more and more people seem to be coming out of the wood works and making an appearence in this film. Of them is AkaRed! Knew he wasn’t dead! I wonder if this will confirm my theory that the AkaRed that was seen in Marvelous’ past was really someone else using a Mobirate with an AkaRed Ranger Key? Any way, he isn’t the only one back. Tsutomu Isobe (WolzardFire), Tetsu Inada (DekaMaster), Hochu Otsuka (Signalman), and Odawa Teruaki (NinjaRed/Hyuuga) have been confirmed as voiceover roles in the movie. And the list for the cast reprising their acting roles has just been expanded. Makoto Naoya returns as Kaijo Tsuyoshi/Akaranger, Miyauchi Hiroshi as Banba Sokichi/Big One, Ohba Kenji as Oume Daigoro/DenjiBlue, Haruta Jyunichi as Kuroda Kanpei/GoggleBlack, Hagiwara Sayoko as Tachibana Rei/DynaPink, Sakamoto Ryosuke as Shiro Go/Red One, Satou Kenta as Hono Riki/RedTurbo, Wada Kenichi as Ryo/Ryu Ranger, and Kikuchi Mika as Umeko/DekaPink. And I’m pretty sure the total list is right there in the corner, but unfortunatly I can’t read Japanese. I can only guess that that’s the whole list. Anyway, here are some more movie screenshots. And so far that’s what I have for the movie. Now let’s look at some stuff coming up in the series! Yes, this is what ShinkenGo-KaiOh looks like, and it is sweet! That should be appearing in the upcoming episode, along with Shiba Kaoru fighting Joe for the ShinkenRed Key. And we get a look into Joe’s past and an in-depth look at the person who trained him. Above is the person that trained Joe, named Sid, and turns out over the next couple of weeks that he is now Barizog. Joe will fight him in ep.12 trying to bring his memory back. It’s also rumored that he will be Go-KaiSilver. And this episode will also show Joe and Marvelous meeting and fighting together for the first time. BOOM! That’s right! Zyuranger in Episode 11! That (hopefully) means that the Zyuranger tribute episode will be up soon. But it looks like the Carranger Tribute will be next, so who know’s how long we’ll have to wait for the Zyuranger tribute. However, in episode 14, it looks like an old friend of Marvelous mysteriously shows up, so who knows, could be a trap, could be Go-KaiSilver. Let’s watch and find out! UPDATE: (4/29/11) Here we go, one last minute pic for the month of April. Hopefully next month we’ll be able to see an actual, non-editted photo of this guy. Author M.F. CalhounPosted on April 27, 2011 April 29, 2011 Categories MC's postsTags AkaRed, Bioman, Dairanger, Dekaranger, Denjiman, Dynaman, Go-KaiSilver, Go-Onger, GoggleV, Goranger, JAKQ, Kaizoku Sentai Go-kaiger, Samurai Sentai Shinkenger, Super Sentai, Tensou Sentai Goseiger, TurborangerLeave a comment on Go-Kaiger 199 Movie and Upcoming episodes: Pics and Rumors Galore! Go-Kaiger in Spring: A look into the habits of space pirates in upcoming episodes. Looks like the Shinkenger episode is coming up next, and it will feature Shiba Kaoru/ who is apparently teaching Joe how to fight with one sword. I’m guessing that this episode brings out the past, as it has past versions of them in the scan, including the rumored relationship between Joe Gibukan and Barizog. And somehow Go-KaiSilver plays into all of this, but no word on where he will be coming into the series. And it looks like Go-KaiOh will be getting a new Legend Machine combination, possibly movie-only formation, which could be the Varidreen from Goranger. In fact if I’m not mistaken, the caption says Goreso-Go-KaiOh, but that probably isn’t the official name. Anyway, here are the Sixth Ranger Keys, some of them don’t have pictures for the back available yet. No back, but probably the same as Hurricanger. Again, no back, but probably just the Dekaranger symbol. His key is actually gold, not just yellow. Other gold senshi will have the same color. Yes, both Go-onGold and Go-onSilver count as sixth rangers. This has already been established. Well, there doesn’t really seem to be any real difference between these keys and the other Ranger Keys. There were rumors that some of the sixth rangers would have different symbols on the backs, but that only seems true for TimeFire. Of course, these probably aren’t the official Ranger Keys, since the back of the BattleKenya Key (not show) is green, when he has a black costume. Plus all of these keys have the same teeth-shape, so they’re probably just the same key re-worked in a program like Photoshop. Since DekaMaster now counts as a sixth ranger, who knows how many other Ranger Keys will either come out or appear in the series. So there may be a chance that other keys like X-1 Mask could come out. Anyway, what do you think, are there any other Ranger Keys that you would like to see? I know it would be cool to see an AkaRed Key, even though it would be really redundant. And if anything else comes out, I’ll be sure to let you know. UPDATE: (4/21/11) Hey, here are the rest of the Ranger Keys, just because. While there isn’t a Bull Black Key front picture, the back of the key has popped up. If anything else pops up, I’ll let you know! Author M.F. CalhounPosted on April 20, 2011 April 21, 2011 Format GalleryCategories MC's postsTags Kaizoku Sentai Go-kaiger, Samurai Sentai Shinkenger, Super Sentai, ToeiLeave a comment on Go-Kaiger in Spring: A look into the habits of space pirates in upcoming episodes. Go-Kaiger Epic news! : Go-KaiSilver and ShinkenGo-KaiOh Debut! Ah, you gotta love all those new scans that pop-up every month. This time we have several scans for Go-Kaiger. First up, let’s cover the biggest bit of news, Go-KaiSilver’s personal robo Go-JyuJin, and his first Legend Machine, Hurricanger’s FuuRaiMaru! That’s right, it’s not a sketch, it’s an actual DX toy version. It has three modes, the main robo mode, a tyranosaurus mode, and a drill battleship mode. A bit of a nod to past dino robos, in particular AbarenOh, it features a red helmet with a gold visor, an anchor symbol similar to the Go-Kaiger Jolly Roger, and several drill gimmicks that are related to Go-KaiSilver’s weapon Go-KaiSpear. It’s big, bad, and blue. And already has a Legend Machine to go with it. The Legend Machine for Hurricanger, this is an upgraded and green version of FuuRaiMaru, one of the smaller robos from the karakuri balls used in the formation of Gorai Senpujin. For it’s combination with Go-KaiOh, it divides into five parts to fit into the five hidden compartments in Go-KaiOh, and a Senpuujin helmet pops out and tops Go-KaiOh. In this combined form, (no real name yet) it can shoot out multiple shurikens from the hidden compartments in the arms and legs, and can combine the two larger two-point shurikens into one four-sided shuriken weapon that can be held. Whether this is suppose to be the next released Legend Machine or not, I’m not sure. But it does look surprisingly good, even if it wasn’t something actually used in Hurricanger. But that isn’t the only surpirse I have for you today. There have been a lot of rumors about ShinkenGo-KaiOh, and what they will use for their Legend Machine, and it seems that GaoLion will be pulling double duty. GaoLion will be appearing in the next episode of Go-Kaiger, along with GaoGo-KaiOh. And supposedly the Shinkenger episode will be the episode after next. I guess Go-KaiOh by itself didn’t have the proper leg shape they wanted. GaoLion first combines with Go-KaiOh by taking the place of the legs and having Go-KaiOh ride it. For the second combination to for ShinkenGo-KaiOh, the hind legs detach and combine with the arms, the head detaches and combines with the chest, and stuff unfolds to reveal the kanji of the Shinkenger Origami, in the order they appear on ShinkenOh. They also get a helmet similar to the ShinkenOh helmet, and a Rekka Daizatou. And they can form a secondary weapon using Go-KaiOh’s sabres, what looks like a bow or a double-bladed sword. While I feel a little ripped off that they didn’t make a separate Legend Machine for Shinkenger, it does look really cool. That’s all for now, if anything else pop out of those hidden compartments, I’ll be sure to analyze and dissect it, and tell you what I find. UPDATE: (4/17/11) Found a bigger, fuller pic of the first one, and it includes two RangerKey sets! Apparently, there’s an arm swapping gimmick between Go-JyuJin and Go-KaiOh, and the next Ranger Key set includes Tyranno Ranger, HurricaneRed, Battle Japan, GoseiRed, and Red Racer, and the first set of RangerKeys for Go-KAiSilver will include MagiShine, DekaBreak, Shurikenger, ShinkenGold, and the Anchor Key that unlocks his Gold form (for info on that, just check the last post in Go-KaiSilver). If I find anything else, I’ll let you know. This is a scan of the full page that FuuRaiMaru was on, and as you can see on the bottom, they seem to have made a top battle-like game using the Shinobi Medals. More word on this if I find out that anybody cares. Author M.F. CalhounPosted on April 16, 2011 April 17, 2011 Categories MC's postsTags Gaoranger, Go-KaiSilver, Kaizoku Sentai Go-kaiger, Samurai Sentai ShinkengerLeave a comment on Go-Kaiger Epic news! : Go-KaiSilver and ShinkenGo-KaiOh Debut! Go-Kaiger movie and upcoming episodes pics: Yeah, another gallery! 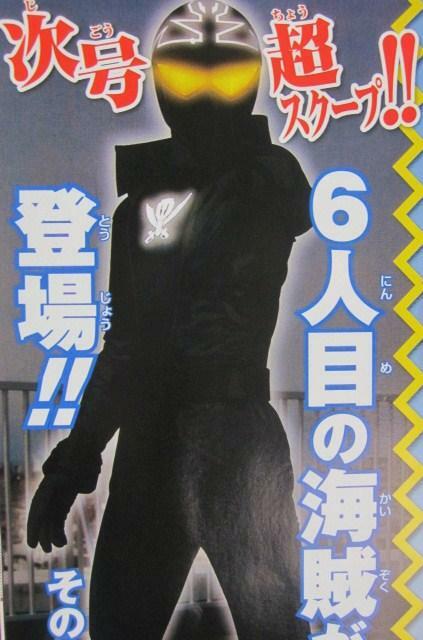 It’s been confirmed that GaoLion (above) will appear in ep.9, along with Kaneko Noboru, aka Shishi Kakeru/GaoRed. What’s this? An unknown Go-KaiOH formation? OOOOOOOOOH……………. This is from upcoming ep.7, I guess by unlocking the true power of Gekiranger, they’ll be able to summon the GekiBeasts. All five of the main ones are there. Is this an epic pic or what?!! You have Goranger, Go-onger, Shinkenger, and Gekiranger firing various cannons and blasters all at the same time. Hate to be on the receiving end of that! And here we have Forever Red II. JK, but still quite a team-up. And now a very similar team-up, but this time in pink! If you’ll notice, in both pics the teams are the same. So who knows how that will play out. 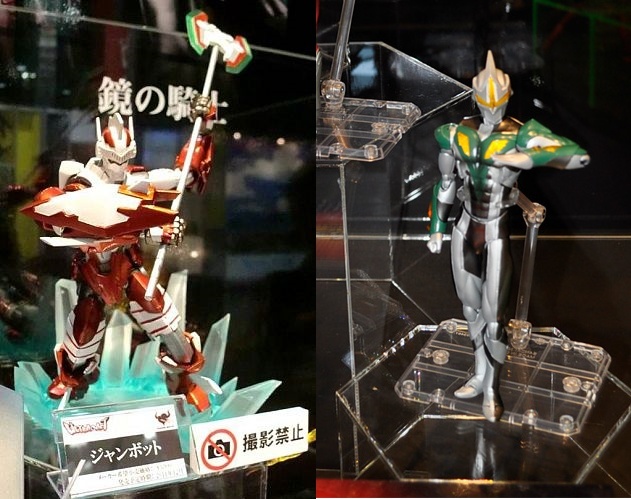 Just some more of the past Sentais that will be in the movie. 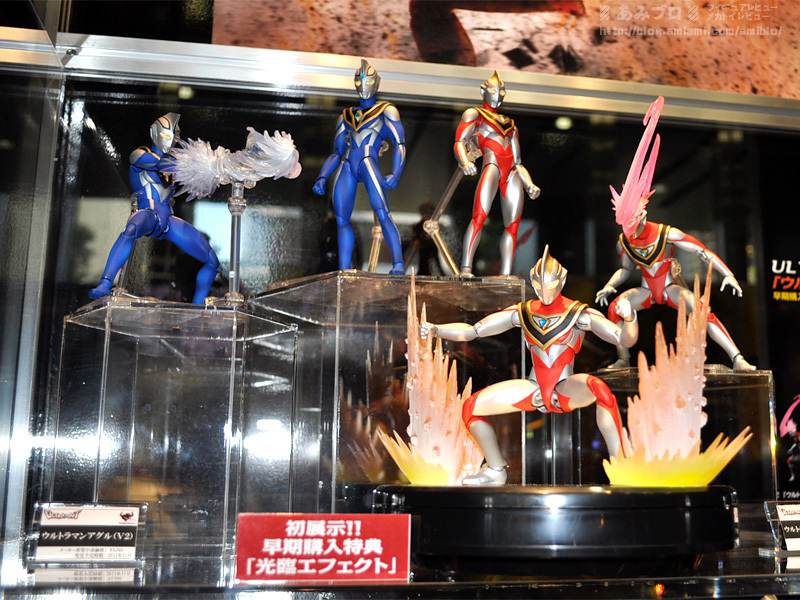 These are the extra senshi that will be in the movie. They really are pulling out all the stops for this! Here are some more revived villains, including Burajira, Yogoshimacritein of Go-onger, and Dagon of Magiranger. All of whom are now serving Black Cross. Here are some past senshi who will appear in the movie, including Wada Keiichi as Ryo/Ryu Ranger(Dairanger), Kikuchi Mika as Umeko/DekaPink, and Oba Kenji as Ome Daigoro/DenjiBlue (he was also in Battle Fever J as Shirou Akebono/BattleKenya). And we end with everyone who has already been confirmed to be in the movie. Still unknown whether or not the other four will play an active role or not. That’s all for now, if anything else pops up I let you know. UPDATE: (3/31/11) Here’s a new magazine leak, sorry the picture is blurred out. Is that ShinkenRed in the that big pixelated mass? Author M.F. CalhounPosted on March 30, 2011 March 31, 2011 Format GalleryCategories MC's postsTags Gaoranger, Gekiranger, Kaizoku Sentai Go-kaiger, Samurai Sentai Shinkenger, Super SentaiLeave a comment on Go-Kaiger movie and upcoming episodes pics: Yeah, another gallery!